We, urban dwellers, depend a lot on domestic help for overall maintenance of our household. They often are treated as a part of the family. However, recently there has been some disturbing news related to crimes involving domestic help. Here’s how you can ensure safety. In early September 2016, the country woke up to some gruesome news from Hyderabad. A 25-year-old maid, Vasundhara Lakshmi, murdered her employer’s neighbor in the most brutal way possible. The culprit had allegedly sneaked into the neighbor’s apartment to steal gold and other valuables but was caught in the act by an elderly woman who resided there. In order to get away with the valuables, Vasundhara Lakshmi proceeds to stab the elder lady repeatedly and then herself, as the commotion had alerted the neighbors. The elderly lady suffered deep injuries that caused severe haemorrhage which led to her death shortly after. Vasundhara Lakshmi is only one of the many domestic helpers who has been involved in criminal activities inside apartment complexes. Some make the news, some get little attention, while many others, go unnoticed. The loss forever belonging to the families of the departed. 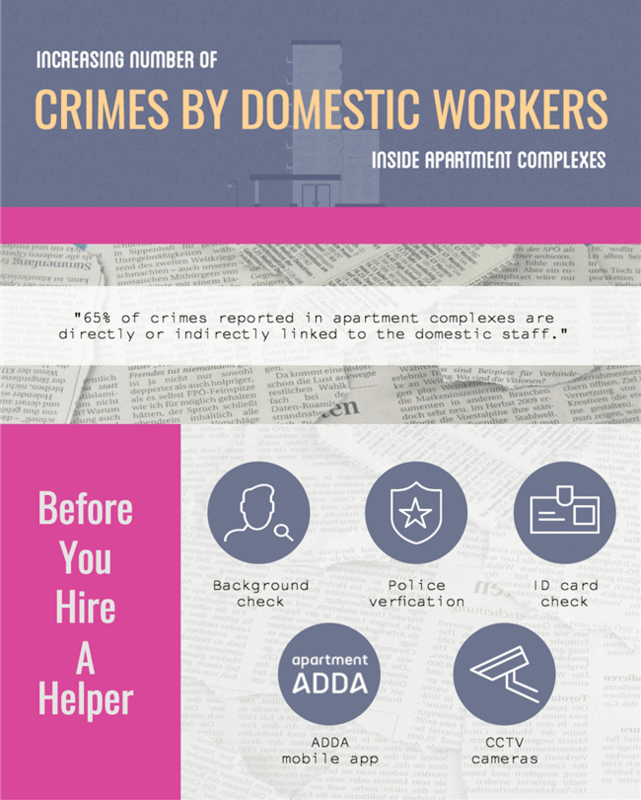 Crimes in apartment complexes, the ones that are noticed at least, often have some connection with the maids or drivers or the staff appointed for domestic support. And so now maybe the right time to ask ourselves – Are we doing enough to ensure the safety of our families against such crimes in Apartment Complexes? Do we have the necessary systems in place to prevent such crimes in future? Let’s enlighten ourselves a little more, shall we? A recent study into the subject has revealed that more than 65% of the crimes in gated communities – petty and otherwise, were carried out by the domestic helpers. The people that were seen as part of the families by the residents and who have access to their homes were often the ones that wreak all the havoc. What is more disturbing is that these people often have a bad record and yet manage to find new jobs because apartment residents sometimes overlook doing a background check. And there’s also the fact that such people often find occupation through recommendations. Not good either way. First and foremost, our security lies in the very realization that we are vulnerable. Only then, will you be prepared for all possible contingencies. Your apartment may be well equipped and monitored by CCTV round the clock, but doing the following will help you immensely, or better, save your life one day. Don’t trust the references: Some people can turn out to be downright violent despite their calm demeanour. Even if a potential maid was sent by a trusted source, carry out a background check complete with a police verification. Be more careful if the person is being a household help for the first time. Secure your valuables: Temptation can lead even saints astray so a mere domestic help would easily be tempted at the sight of gold, money lying around. Keep them locked away, or better keep them in a bank locker if they are that valuable. And most importantly, do not speak about them in the presence of the helper. Copies of their ID cards: And even better, keep a photo of theirs. If the person claims that they have no valid ID, best not to hire them. There are many immigrants from neighboring countries like Bangladesh and Nepal, who do not have any IDs and take up work as domestic staff. As a community, you can consider coming together along with help from your management committee to conduct a drive to get valid IDs for all such help. Have eyes on your house: Thanks to technology, you can be watching over your home and your family even while you are physically away. Install security cameras, ideally the ones that can broadcast especially if you leave your kids in the care of a nanny. Start using the ADDA app: The ADDA app is a good tool to bring all the residents in the apartment close to each other. It is also a handy communication system that can help you raise an alarm in case of an emergency. Also, before hiring a maid you can ask for recommendations/suggestions from your neighbors via the ADDA App. Do share this article with your friends and family and everyone of concern to you. It could happen to you, it could happen to us. But in seeing this as a real threat and acting upon, we are taking the right steps to curb this dangerous trend. Let us all come together and do what it takes to have a safer, happier experience in living within apartment complexes. Cheers!